Summit majestic Half Dome on our Yosemite Half Dome Backpacking Trip, arguably the most iconic feature in Yosemite National Park, on this incredible guided 4-day trip. Half Dome rises 4,800 feet above Yosemite Valley, and is well known for the challenging summit trail that requires hikers to climb the final 400 feet on a 45-degree smooth granite slope using a cable ladder. 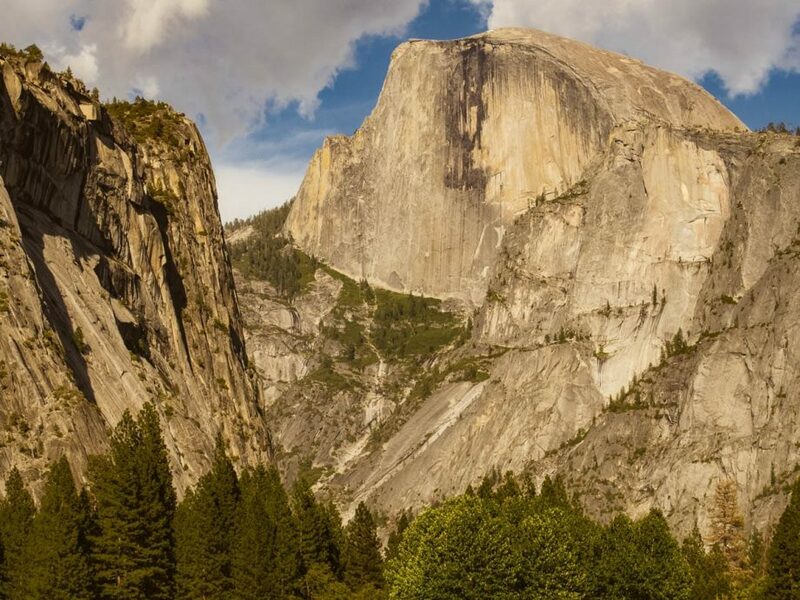 Half Dome permits are included, and no climbing or mountaineering skills or experience is required. This trip is typically offered between early June and mid July. Backcountry permits for Yosemite National Park become available 24 weeks in advance of the hiking start date. We will post 2019 trip dates as we acquire the permits, typically between mid December and early February. This trip is offered between early July and late September. Backcountry permits for Yosemite National Park become available 24 weeks in advance of the hiking start date. We will continue to post 2019 trip dates as we acquire the permits, typically we have all dates by mid April. 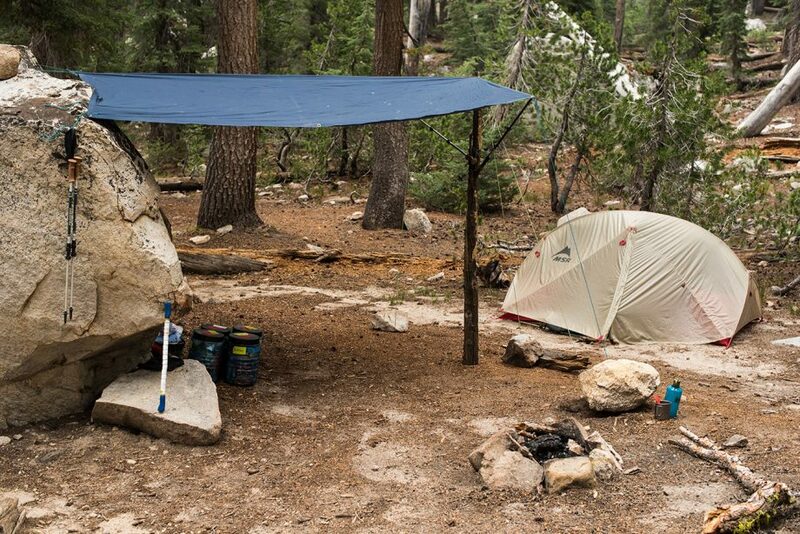 We spend the first night of this trip in North Pines Backpacker’s Campground and traverse the Yosemite high country over three days. 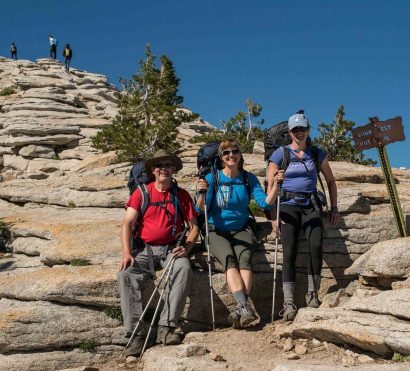 While hiking, our expert backcountry guides will share info about the region’s history and geography as well as some Half Dome backpacking wisdom. 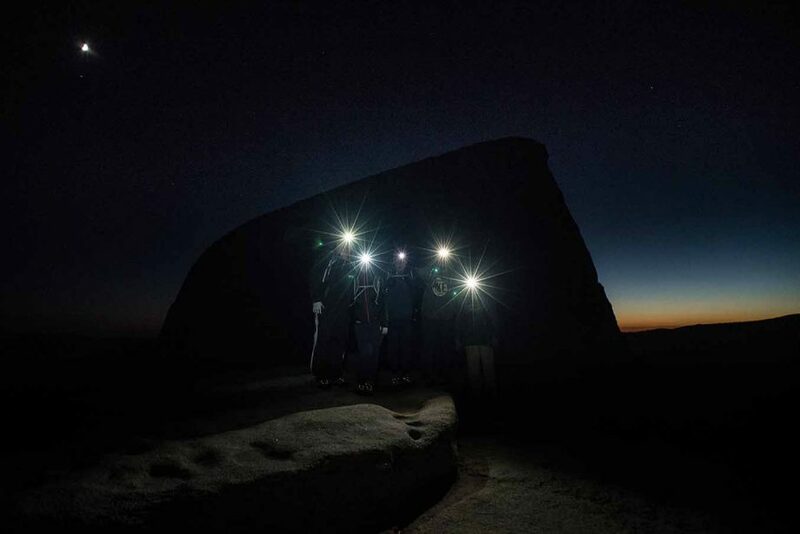 Days are filled with hiking and exploring, while evenings offer unmatched stargazing and campfire camaraderie. 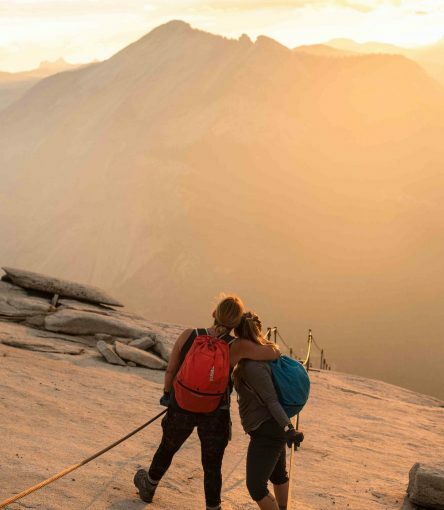 Each trip will be unique, but every departure will offer an opportunity to climb to the top of Half Dome to experience the thrill and vistas from the summit. Trip Start: Meets at North Pines Backpackers Campground at 3pm on Day 1. Trip End: Ends at North Pines Backpackers Campground between 5-7pm on Day 4. Meet your Yosemite backpacking guide at North Pines Backpacker’s Campground in Yosemite National Park at 3:00pm for a trip orientation. North Pines Backpacker’s Campground is behind the North Pines Campground and across the footbridge. Your guide will begin with introductions and a brief orientation where all gear will be distributed and everyone will help to set up camp for the night. This time will be used to get acquainted with each other, the equipment, and your incredible surroundings. After getting settled in and eating dinner we will head into Yosemite Valley for a local activity to help get to know the area, this may include watching climbers on the famed walls of El Capitan, checking out the Ansel Adams Gallery, or even attending a film or performance at Yosemite Theater. Afterward, we will head back to camp to hit the sack in preparation for an early start! After breakfast, we will depart for the Yosemite trails either on foot or via the park’s shuttle system depending on the route. Today, we will conquer our first full day of trekking in Yosemite (exact distance and elevations are dependent on permits available). As we hike along, you are sure to enjoy the epic views while your guide shares tips, tricks and interpretation. Tonight, we camp under the stars and let the sounds of the great gray owl and the wind in the trees lull us to sleep. DAY 3: Hike to Little Yosemite Valley/Possible Summit Day! Wake in camp to the crisp mountain air and hot coffee brewing. 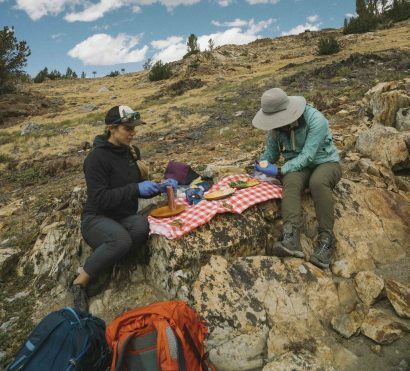 Each morning we fuel up with a well-proportioned breakfast and then head deeper into Yosemite’s backcountry. Depending on our route, this might be the day we summit Half Dome (route changes with each departure). After breaking camp, we head for Little Yosemite Valley, a small glacially carved valley bisected by the Merced River. The views from Little Yosemite Valley and the hike through Yosemite’s wilderness allow a clear picture of the hand that glaciers had in shaping Yosemite. The world-famous naturalist John Muir became fascinated with glaciers when exploring Yosemite and was among the first to propose that Yosemite Valley was formed by the movement of glaciers during the ice-age. On our hike today we’ll get a good look at why Muir formed this theory and come to better understand his love for glaciers and Yosemite, and how this place served as inspiration in developing his love of the Alaskan wilderness. When we make camp, there will be time to swim in the Merced River before settling into a delicious backcountry meal, followed by a relaxing night in Little Yosemite Valley. DAY 4: Summit Day/Hike out via Yosemite Valley! If today is summit day, we will be up before the sun and ready to hit the trail at first light! Don’t worry, your guides will greet you with fresh coffee to get the body moving. Just a few hours after we wake, we will summit Half Dome via the famous cables and stand in awe of the incredible view. The celebrating continues after we descend back to camp to enjoy a well-deserved brunch. After fueling up, we pack up camp and head out for the remaining 7 miles of hiking. We end our adventure together at Half Dome Village sometime between 5:00 – 7:00pm. 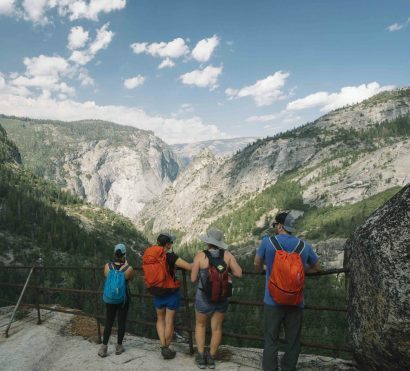 Cell service & Electricity: While backpacking in Yosemite, it’s unlikely you will have cell phone service, you should expect to be unreachable by phone. There is no electricity available. Bring a portable battery to charge your phone for photos. This backpacking trip requires that you carry all you need and a portion of the group gear on your back during the hikes on days 2 and 4. Expect to carry about 35-50lbs in your backpack. You will only carry a daypack during your summit. Keep in mind that a Half Dome summit is always weather dependent and safety comes first. 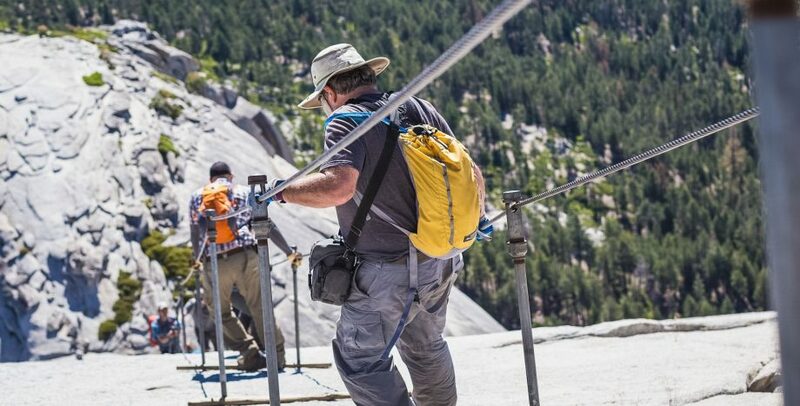 The hike up Half Dome is not for everyone, particularly those with fear of heights. Wildfires are a serious threat in Yosemite, and there is always a risk a backcountry trip can be rerouted due to fires. 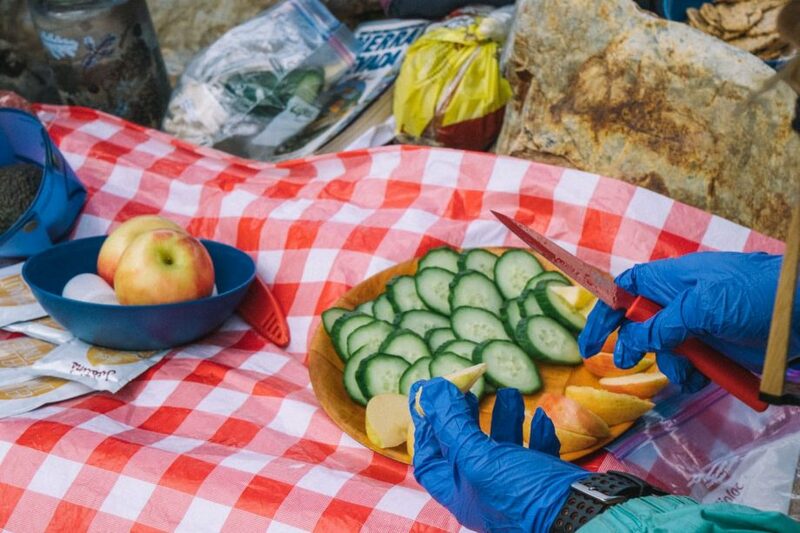 Bears in Yosemite have become accustomed to visitors and know that hikers carry food. Because of this, all park visitors must take mandatory precautions to lock up all “smellable” items from hand lotion to snacks in bear-proof cans. This keeps the bears and the visitors safe. It can be a challenge, but our guides will help you make sure your gear and campsite is bearproof.